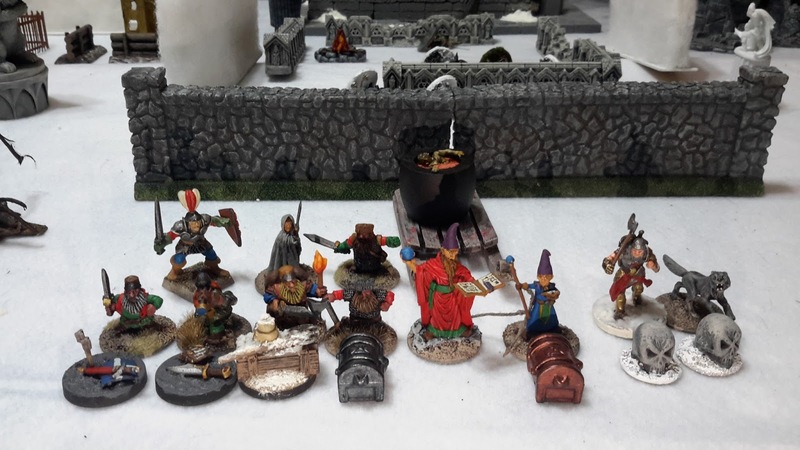 Campaign Game 9 – The Cauldrons | H.A.W.K.S. 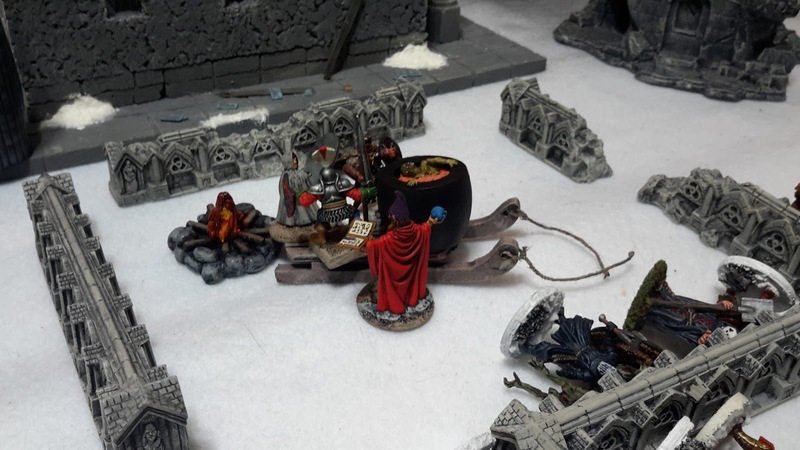 Last month we played game 9 of this year’s campaign, the Dark Cauldron scenario from the Thaw of the Lich Lord. You can find Quail’s report here The Dark Cauldron. 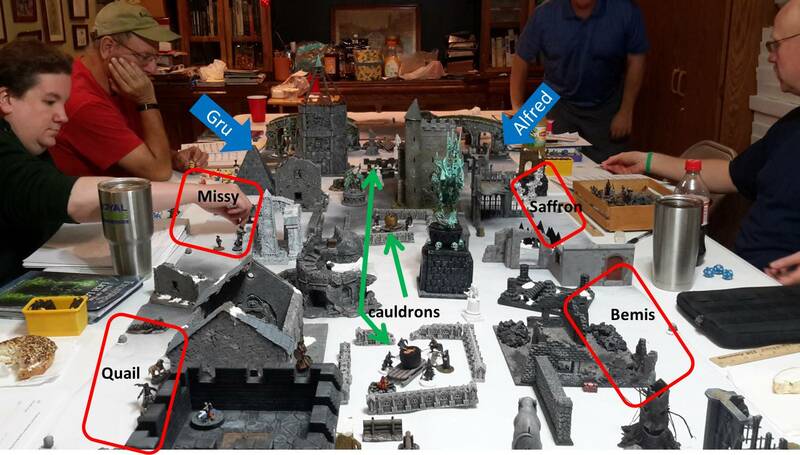 We only had six of our regular players available so that meant there would be three cauldrons along the centerline of the table. 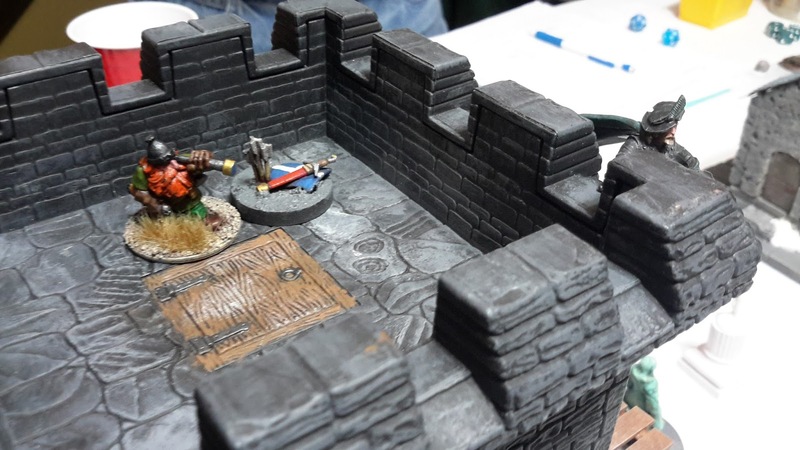 With all the gold earned from the last game, Bemis was able to spruce up his base with a few purchases: a Scriptorium, a Cauldron, and a Celestial Telescope. To my front was my old friend Quail. Diagonally and to the right was the evil Necromancer Missy and to my immediate right was the Summoner Saffron (He claims the name is really Challara but you know how demon worshipers stretch the truth). At the far end of the table were Alfred the Unready and the strange yellow wizard creature called Gru. 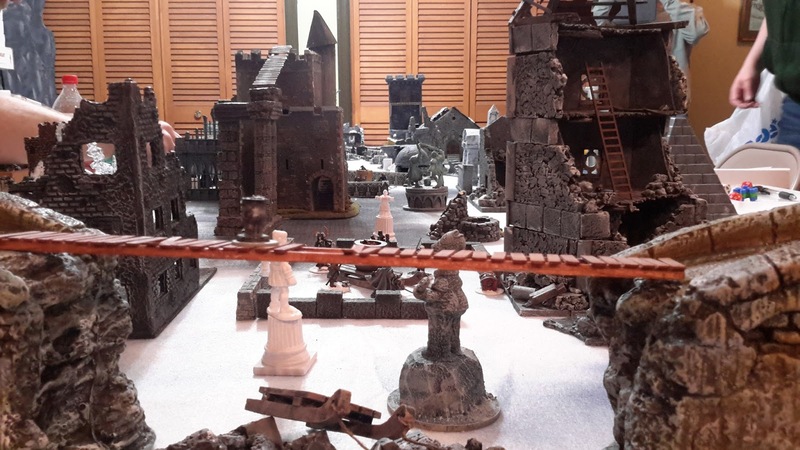 “Hey boss, looks like everyone is preparing to enter the ruins tomorrow in an attempt to counter the Lich Lord’s activities. Are we going in too?” asked Nigel. Bemis looked up thoughtfully from the arcane tome he was reading. “Yes, I think it is best if we do. An evil stench is falling over the area. Get the lads prepared to move out early in the morning.” he replied. Taking a sip of tea, Bemis pondered the reports he had been hearing. Random dissappearances, graves being robbed of corpses, and a persistent and reoccurring mist had him worried what it all might mean. Finishing his tea, he called out to Agarn to join him in the workshop. Together they sat down and worked on preparing scrolls for the next day. Things were made easier with the acquisition of his new scriptorium (both successfully cast Write Scroll – Drain Word and Reveal Secret). The two then moved over to the alchemical work area to try out the new brewing cauldron (Bemis splashed the cash). They managed to brew up two healing potions (both successfully cast Brew Potion). After several hours, Bemis finally moved over to try out his new Celestial Telescope to try and gain some insight into the next day’s trip. However, something was preventing him from focusing into Felstad (failed castings of Reveal Secret). So he decided to utilize his newly written scroll – Reveal Secret. The image he received in his mind showed something located in the roots of a haunted tree. He told Agarn it was his responsibility to find recover the object. The last thing they did was attempt to summon some familiars but both failed their castings. Early the next morning, Bemis and friends move through the ruins towards the sound of some chanting. Visibility was reduced due to a low hanging mist (16 inch line of sight). 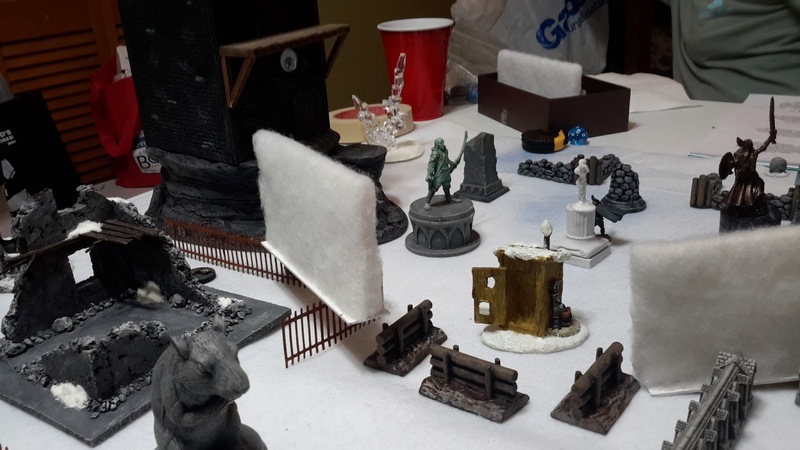 Bemis, detecting some movement nearby, casts Fog to cover his warband. 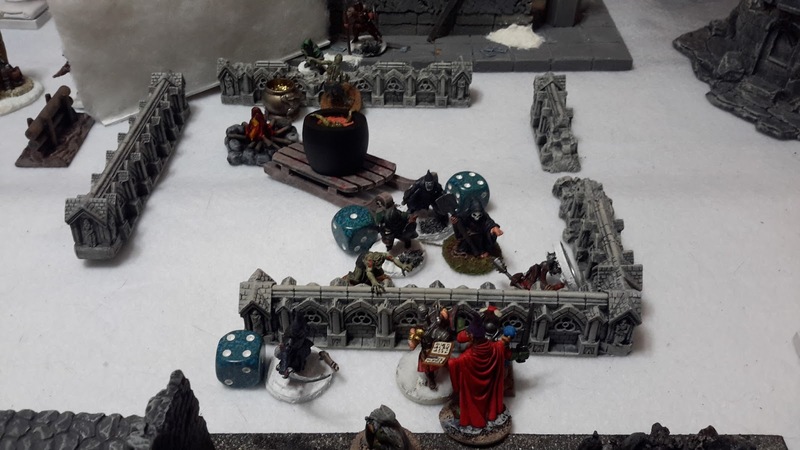 Nigel, Vale, and 9Toe round a corner and find themselves facing five cultists. And to make matters worst, a zombie climbs out of the cauldron and shambles towards them. Agarn attmpted to cast Drain Word but really stumbled on the incantation. He quickly unrolls a scroll to complete the casting – Drain Word – Bone Dart. 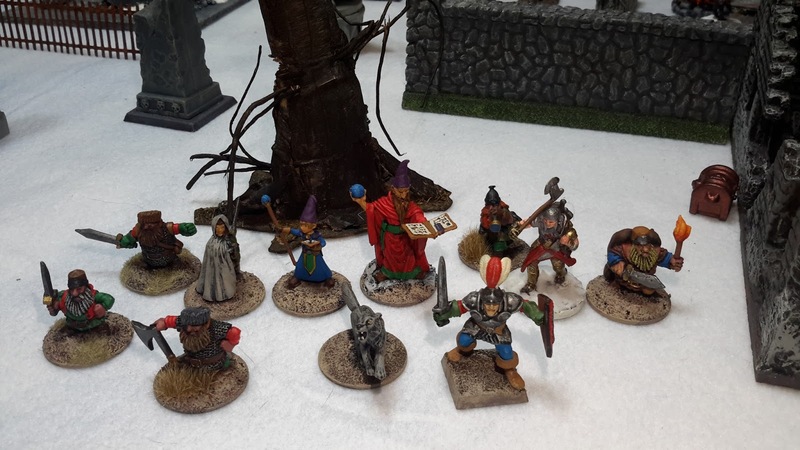 The cultists charge. Nigel finds himself engaged with two of these foul humans, killing one (10 xp for Nigel, 10 xp for the warband) and driving off the other. Vale finds himself enaged with two cultists as well but isn’t as successful as he incurs a minor wound. He is then set upon by the zombie which also causes him a wound. Bemis again decides to cast Fog to cover his group. Agarn spots something laying in the snow and manages to cast Telekinesis to move it closer. 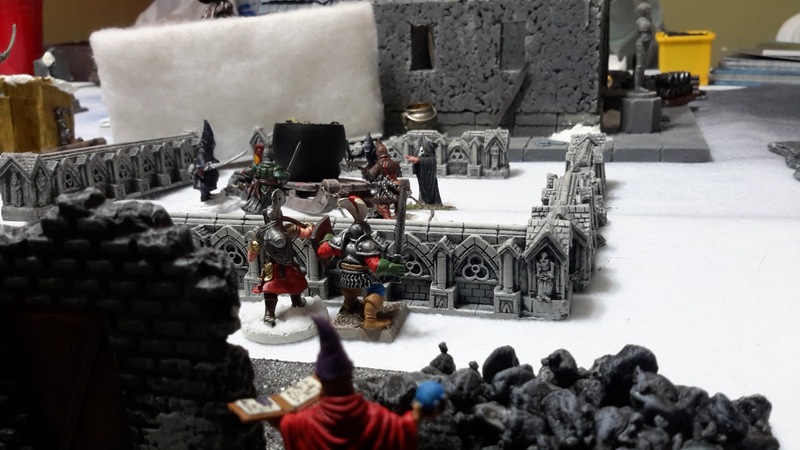 Nigel fights the cultist again, and after two rounds manages to slay him (10 xp for Nigel, 10 xp for the warband). Vale is overwhelmed by the zombie and slumps to the ground. 9Toe manages to scoop up a small box laying in the ruins. As he does so, he hears the moanful howlings of two rangifers off in the distance. “Hope they are not coming this way” he thinks to himself (Fortunately they appeared near Buck’s warband). 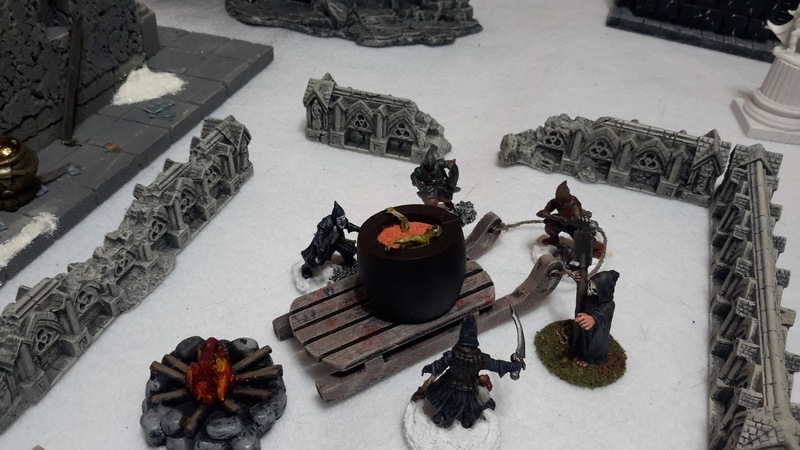 Another zombie crawled out of the cauldron but fortunately moved towards Quail’s warband. Meanwhile, over to the left, Diesel Vin decides to teleport to the top of a nearby tower using a Potion of Teleport. This was probably speeded along by the appearance of a specter nearby. The specter also enticed Piko into drinking his Potion of Invisibility as he moved over to a small treasure chest. Kleppo and Shadow gang up on Quail’s dog but only manage to inflict a minor wound. 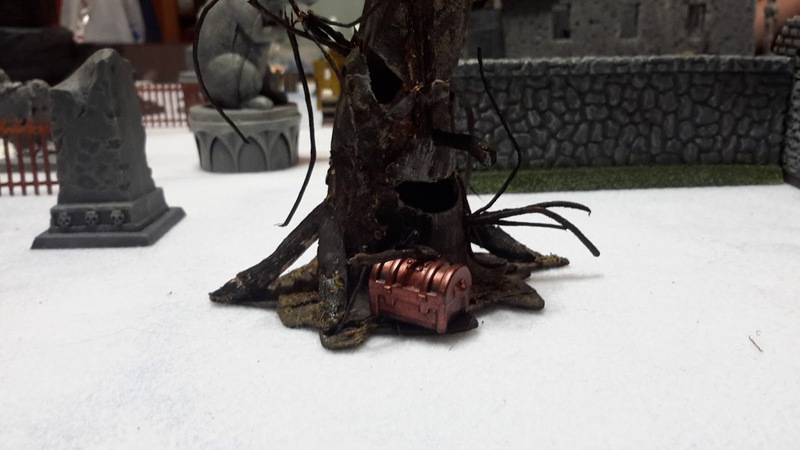 Bemis again casts Grenade, successfully this time. Sadly it failed to cause any damage to Quail’s warband. Agarn forgo a chance to cast in order to pickup a treasure. 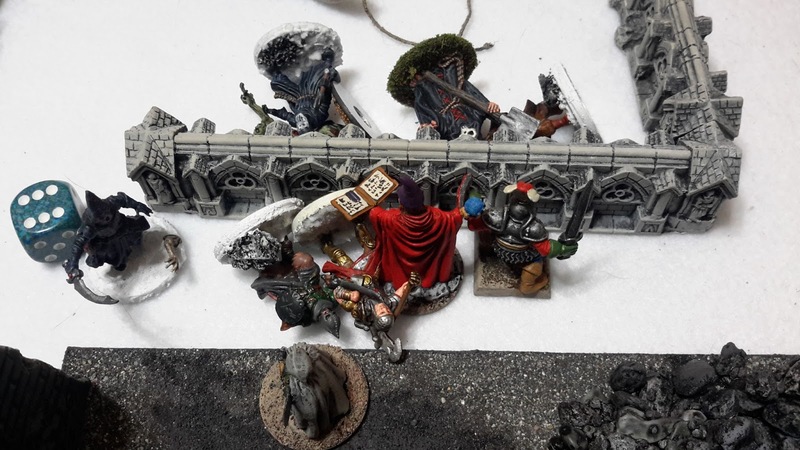 Nigel continued his melee with the cultist band killing the last of them with a well placed thrust (10 xp for Nigel, 10 xp for the warband). Diesel is delighted to see a treasure chest on top of the tower and quickly grabs it. As he does so, he can here the sound of someone or something climbing up the tower. Piko, seeing the specter past around a corner of some ruins, cancels his invisibility by picking up a treasure. Kleppo and Shadow manage to take down Quail’s hound. Bemis notices some members of the evil necromancer Missy’s warband maneuvering in his direction. He attempts to cast Fog but fails. Where the master failed, the young apprentice succeeds as Agarn manages to cast Fog to provide some cover. from Missy’s minions. Diesel finds himself faced by Quail’s thief as Quail herself teleports to the top of the tower. “This isn’t going to end well for me” ran through Diesel’s mind as he engaged Quail’s thief. Piko, with a treasure tucked into his backpack decides to head to the rendezvous point. Shadow finds himself skewered by a crossbow bolt and slumps to the ground unconscious. Kleppo, decides to back away, and moves towards Agarn’s location. 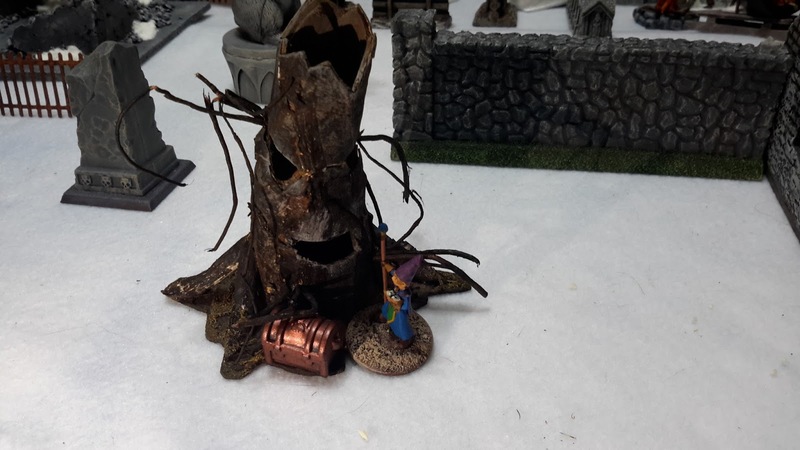 As Agarn is trying to extract himself from the ruins with his treasure, he is attacked by a random skeleton. 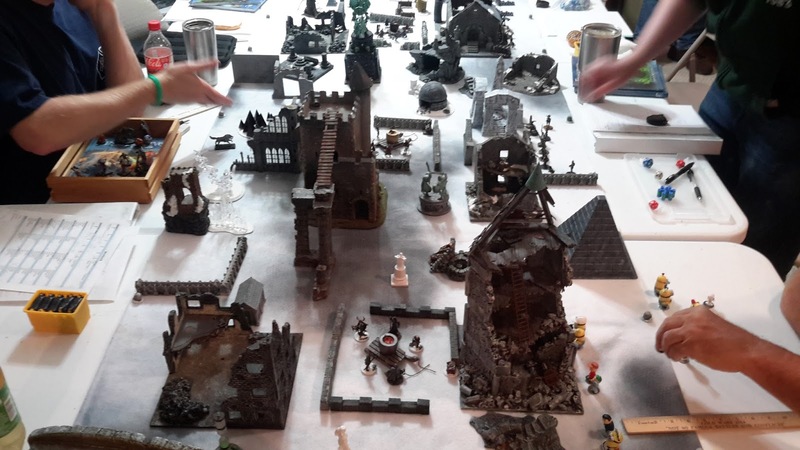 Agarn manages to fight him off but notices a specter heading his way as well as Quail’s barbarian who somehow managed to infiltrate behind Bemis’ warband. “Help Bemis Help” he yelled. Bemis looks around when he hears Agarn’s plea. 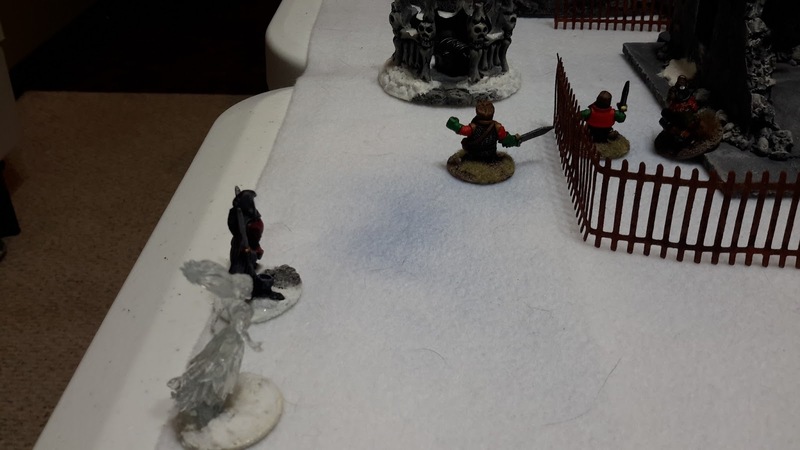 He doesn’t see Agarn, but he does notice several crossbowmen from the evil Missy’s warband moving into firing position. He attempts to cast Fog again to cover his men. He stumbles over the incantation but forces himself to properly complete the spell. He slumps to one knee with the effort, requiring 9Toe’s assistance to stand (pushed the spell for 9 pts). 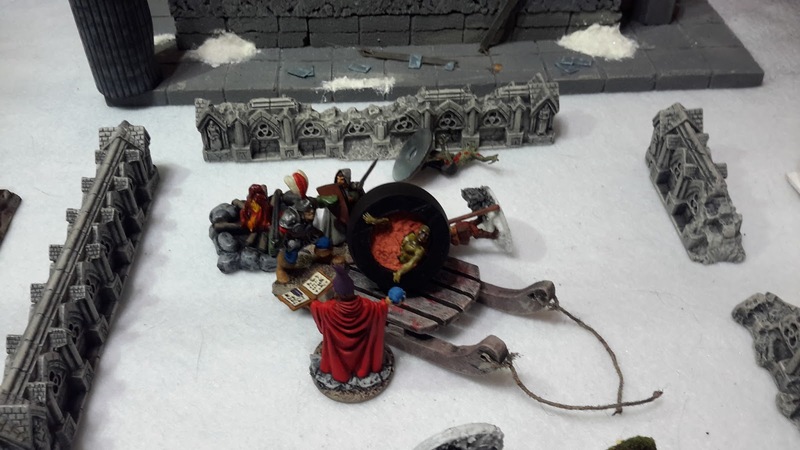 Nigel and 9Toe then prepare to tow the sled and cauldron out of the ruins. Will Diesel survive the encounter with Quail and her thief? Will Agarn escape the triple threat of the specter, skeleton, and Quail’s barbarian? 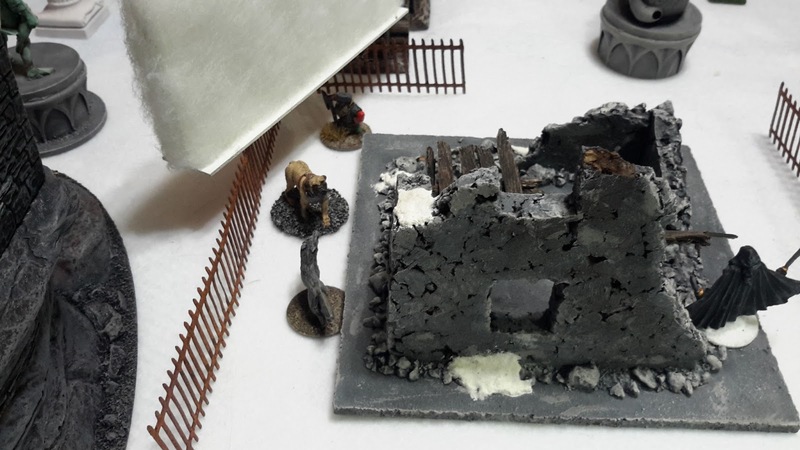 I’d like to be able to conclude the story but this is where the game ended as Alfred the Unready’s warband left the ruins. It did not look good for Diesel and Agarn but luckily for them, they survived with their two treasures – much to Quail’s chagrin. But it did seem like a hollow victory due to the unfinished nature of how it played out. But, a treasure is a treasure and Agarn surivived to boast how he evaded all three of his opponents. Diesel just thanked his lucky dwarven star that he did not actually have to fight Quail in hand-to-hand. 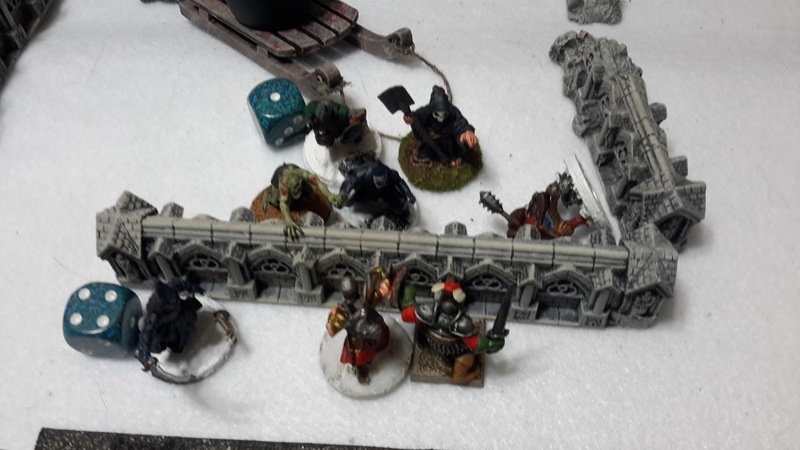 Other than the feeling of “unfinished business”, it turned out to be a great outing for Bemis as his warband managed to recover 5 treasures. The treasure was 3 scrolls, 3 potions, 2 grimoires, Gloves of Strength and 530 gold (68 gold was paid to Nigel). Bemis earned 370 experience and Nigel earned 50 experience.